April Fails Day - "So what's your strategy?" Uh oh, guys. She's using the Gay Icon. No, really, wtf Script Frenzy? XD My characters have already revolted and done personality one-eighties. Nick commences typing I'm so glad to hear that; it's just amazing knowing you, even just here and jumps as his phone rings violently where it sits on the desk beside him, singing out a very loud and slightly distorted rendition of the Breaking Benjamin song "Breath." He hits Enter, snatches the phone up, fumbles it open, and puts it to his ear. One of those might be right. Claire has responded, lol youre welcome! Eew! Don't even say that, Christ! And you know she's real; I showed you her Facebook page. You're high. What do you want? I want to know if this "Claire" character is sending you home-cooked meals from Florida yet. Do they eat alligator in Florida? They eat your mom. Are you saying you're hungry? The Great Interpreter strikes again. Go to hell. Where do you want to eat? If I knew, I'd be telling, rather than asking. The only thing you've asked is whether they eat alligator in Florida. Touché. Burrito Barn in ten minutes, you think? It gets even worse when they actually talk in person, true story. XD And it'll probably just spiral downward from here, because that's how we roll. On the floor. Laughing? IN OTHER NEWZ, you should be proud of my tremendous restraint. Lots of the Easter candy was on sale at Walgreens, but I only bought five dollars' worth. Truly. The temptation was immense. So. Usually what I do when there's a play to be read for Theater 25 is get up early and head to the library before my MWF class. Last night, I determined that the one I needed was in no less than *two* of our campus libraries, the big one and the Englishy one I usually frequent for such things, and was like, "Okay, I'll get it after class and Rickroll some unsuspecting classmates with my morning instead." I'm still a little proud of myself or something. Anyway, I went to the Englishy library after class only to find that someone had had the AUDACITY to check the book out before me. BASTARDS. So I went to the big library, which said it was checked in, but instead, it was... MISSING FROM THE SHELF. As we learned in my picspam, I could have crushed them between the shelves. So I went home and sulked and wrote Script Frenziness for a while, and then I walked a mile back up to the bookstore to see if they had it in stock, which I imagined was unlikely, because required reading tends to disappear precipitously the day before it is required to be read. But there were two copies left. So I snagged one. And brought it back. And read it. "The Laramie Project." Moisés Kaufman. Just... wow. The basic idea is that they wrote a play-like-a-documentary-like-a-play about this Matthew Shepard homicide, and... just wow. I don't even entirely know how I feel about it. It's almost too horrible, and too real, and too much. Because that's kind of the point -- it gives you everything, everybody's thoughts, and doesn't tell you who's right. Which is horrible, really, in a lot of ways. I want to make everyone I know read it, and at the same time, I think a lot of them wouldn't understand it at all -- or would take it wrong. Except you can't take it wrong, because that's the point, too. As does my slightly unsteady moral compass. I've been noticing recently, mostly since we started our culture-race-gender-sexuality unit (which is really what it is; it's insane XD) in this Theater 25 of mine, that... this is the class I'd kind of been waiting for. The professor is an incredibly histrionic black Republican mom (? !, right? XD Particularly given this campus XD), and I love her, and she's hilarious, and the reading list alone has changed my worldview in small-but-drastic ways. This is what college is supposed to be about. This is how assigned reading is supposed to feel. GAH, your Script actually sounds really interesting. Dude, seriously. Me and icequeenrex used to talk weirdly all the time in public, and people used to ask us whether we scripted our convos. 1) v.o. apparently automatically registers as Vidalia onion in my head. 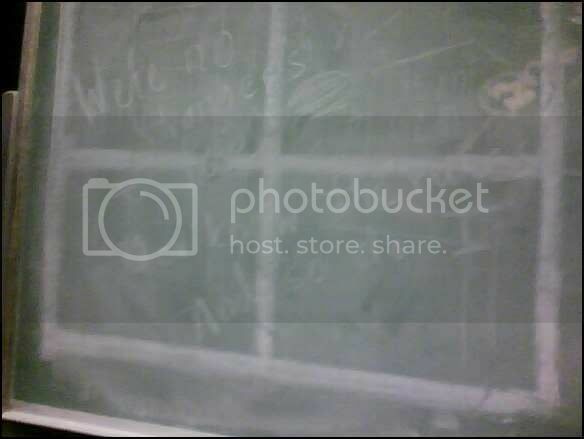 2) Chalkboard translation, plz? I can only tell that it starts with "we're no." 3) Sounds like quite the play! How dare someone check out the book you wanted! I am appalled. You just don't do that to people like tierfal! You just don't. This is PaperAngel, by the way, from FanFiction? Yeah. :DD 1. Could you send me Script Frenzy (my email is lullydoll at yahoo dot com) and 2. I really really need tips on writing in script format. Comment back on my LJ (Lullydoll...because I'm unoriginal).